Eurocom is launching the M.2 1TB Samsung 850 Evo SSD in all systems that have M.2 capability. Now customers can configure their fully upgradeable Eurocom Mobile Workstation or Laptop with up to two high performance 1 TB Samsung M.2 850 Evo SSDs for optimized endurance and performance, hardware based encryption and Dynamic Thermal Guard” Mark Bialic, Eurocom President. Powered by Samsung's V-NAND technology, the 850 EVO transforms the Eurocom computing experience with optimized performance and endurance. The 850 EVO optimizes performance for your daily computing tasks, boasting sequential write speeds up to 520 MB/s with TurboWrite technology and sequential read speeds up to 540 MB/s. Plus, RAPID mode to further boost performance for up to 2x faster data processing speeds by utilizing unused PC memory as cache storage. 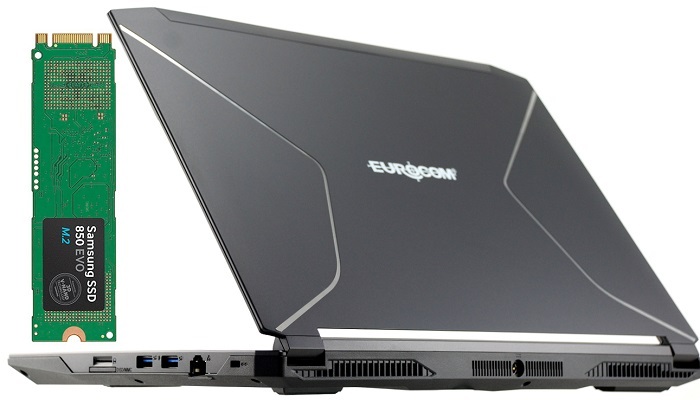 Eurocom laptops can now be combined with NVIDIA GeForce GTX 980, 980M and Quadro M5000M MXM graphics, Intel Core i7-6700K processors, up to 64 GB of memory and now up to two M.2 1TB Samsung 850 Evo SSDs. Eurocom laptops are used for mission critical application all over the world, because of this we take security very seriously, the M.2 1TB Samsung 850 Evo SSD is equipped with AES 256-bit hardware-based encryption for maximum security to keep our customers data safe. Combined with available smart card readers, finger print readers, Kensington lock ports and TPM 2 Modules, Eurocom is doing everything we can to keep your data safe.